Seyed Alavi is a conceptual installation artist who has created numerous public art projects over the course of his career, engaging with the poetics and power of language and space as they shape our contemporary reality. 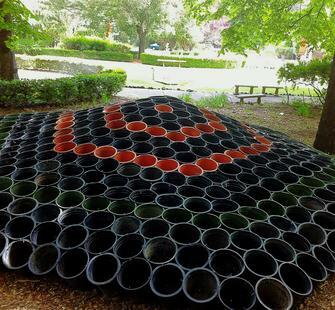 A spring 2011 residency at Montalvo provided him with a unique opportunity to experiment with new repurposed materials and generate large-scale forms in an outdoor public setting. He views A Fabric Study in Pots as a study or sketch, possibly the first of several iterations of sculpture methodically built from a system of units and measurements.